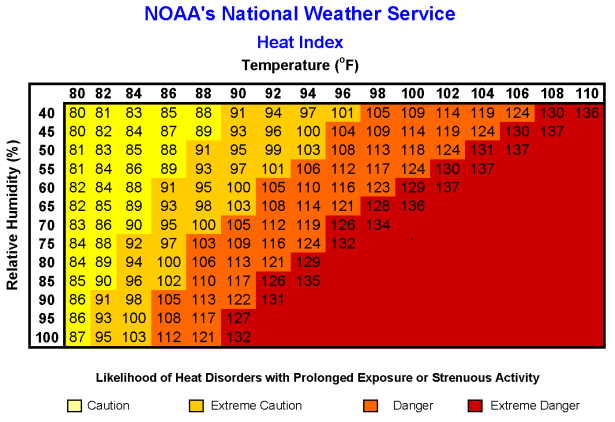 Heat Index (Apparent Temperature) - A measure of human discomfort due to the combination of heat and humidity. It is a more accurate measure than air temperature alone for estimating the risk of heat and its effects on human physiology. Exposure to full sunshine can increase the heat index by 15 degrees. 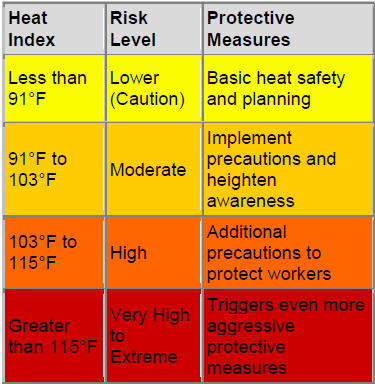 OSHA has divided heat index values into four bands associated with four risk levels. These colored bands differ slightly from those appearing in the NOAA Heat Index chart, which was developed for the public. The NOAA bands have been modified for use at worksites. * Assumes no impact from the sun (i.e., clear night sky).